The structure of the home tends to act as natural vacuum. It creates a strong negative pressure zone on the soil beneath and around the home. It draws air in at the lower levels of the structure and forces air out at the upper levels. Your home is virtually breathing in and out continuously. The makeup air that is pulled from the soil brings with it a number of contaminants. In addition to the radon gas the sub slab air contains bacteria, molds, fungal spores, and dissolved organics which can induce mold growth and contribute to odors. 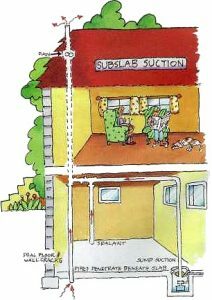 It is with this sub slab air that radon is drawn to the interior of the structure. Because radon is a gas a it will easily infiltrate through tiny openings which have direct contact with the soil, and since it is an atom it will move through any man made material driven by the force of diffusion. 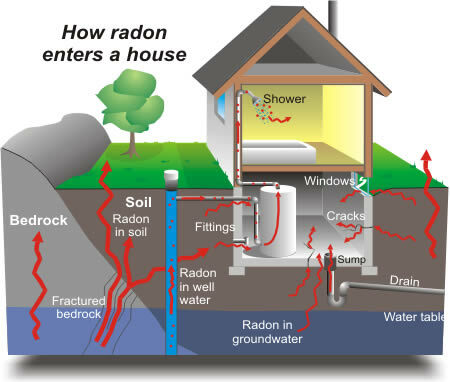 Consequently, you can not seal radon or other soil gases out. In their atomic form the gases are too smallto be completely blocked by barriers. Proper and conscientious sealing may slow the rate of infiltration but it can never completely stop it. Sump pits, floor drains, utility piping, even some cracks in the floor become the inevitable pathways through which soil gases and vapors escape into the atmosphere. The purpose of a proper mitigation is to see that these contaminants do not remain in the home. The word “mitigation” come from a latin root word that means ” to lead”. This is what a properly installed mitigation does – it leads the soil gases through the structure and eliminates the entry into the living envelope . Since it is impossible to prevent the soil gas from escaping into the atmosphere, a soil depressurization system uses a vacuum system to capture the Sub slab air and guide the gases from the soil to a discharge stack outside of the home.